In his Tristam Shandy, Laurence Sterne has the ‘hero’ quote from William Hogarth’s Analysis of Beauty (1753). Obviously delighted with Hogarth’s work, Sterne wrote a letter: ‘I would give both my Ears…for no more than ten Strokes of Howgarth’s witty Chissel, to clap at the front of my next Edition of Shandy.’ In the second edition (1760), Hogarth’s image of Trim reading the sermon appeared as a frontispiece with reference to the text at ‘Vol. 2, page 128.’ In this edition of 1782, the text reference has gone, leaving only the succinct ‘Frontispiece. Vol. I’ at top; no doubt a helpful reminder to the binder. Joseph Collyer (1748–1827) engraved this image; the first was done by Simon François Ravenet (1706- 1764), one of Hogarth’s assistants. 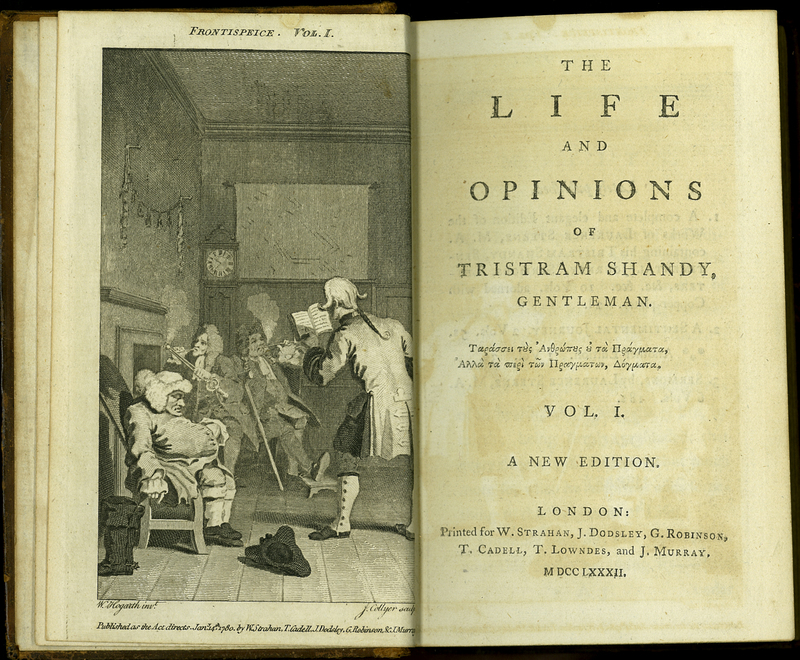 Laurence Sterne, “The Life and Opinions of Tristram Shandy, Gentleman,” ourheritage.ac.nz | OUR Heritage, accessed April 22, 2019, http://otago.ourheritage.ac.nz/items/show/10700.